Using simple mechanical hinges and pistons, this inventive staircase easily folds flush up against a wall to expand a lower space and/or to restrict access to an upper floor. The mechanics within the design allow any person to easily open or close the staircase from upstairs or downstairs. Inner pistons help slide the stairs back up swiftly to create a flush wall. The pistons also act as a gradient to lower each step individually after the stairs have been pulled out, creating a gradual, elegant wave-like pattern as the steps individually lock into place. This project originated from a door project in which I was asked to define what a door was and could be. I defined a door as "an element of a wall that allowed passageway to another environment when opened and restricted passageway when closed." Sikorsky Aircraft Corporation entered the commercial market with their VIP S-92 helicopter which would be offered to high stakes clients. They asked for an exploration of their interior space, structure, layout, and ideas using technology, in their terms, high end electronics. Having experienced the space, which is really crammed being 6 feet high, and about 6 feet wide, the sense of space was a huge issue, especially sitting under a big loud blender like engine. How could you create a notion of space in such a tiny space and still feel exclusive and comfortable. 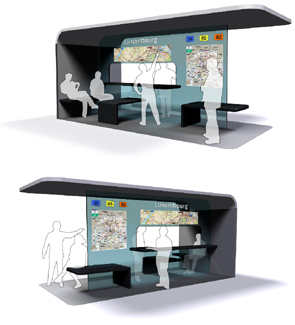 To approach this issue, visual elements within the proposed design were used. Sikorsky supplied us with their engineers to grill us and tell us what was possible. To create a sense of space in this particular proposal was to eliminate the visual clutterness. Seats would mount from the side, which created a larger visual of the floor, a different construction for the helicopter was used to allow larger sky scraper like windows which would change from opaque to transparent, lights would disappear when not used, and emerging technologies were concealed or hidden when not in use. On glass projection systems were used for larger but physically less cluttered space. A deconstruction of elements within the space allowed for many improvements. The project exploration actually created 2 extra feet of space in the fuselage and a much larger visual space by taking visual sensation into account for physical space. The space was very much influenced by Japanese temple designs which use light and transparency to create a visual and soothing sense of space. Many designed elements are not noticible in still images as that was the point in this project, to conceal, open, and create a relaxing uncluttered emotional experience. 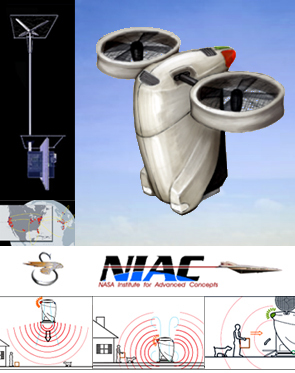 Sikorsky Aircraft Corporation and NIAC (NASA Institute for Advanced Concepts) focused on the future of package transportation by looking at VTOL (Vertical Take-Off and Landing) aerial vehicles, also known as AVSLA: Autonomous VTOL Scalable Logistics Architecture -in essence, smart flying robots- as part of a rapid delivery system for high priority packages for usage in the future, 10-20 years ahead. 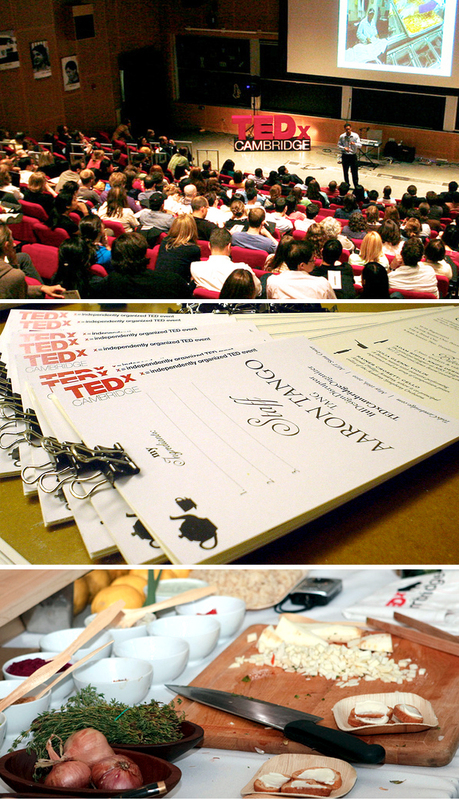 The primary objective for the design team was to envision feasible "system-of-systems" delivery solutions by thinking creatively, having knowledge in the "Human Experience", researching the realities in engineering, overall cost efficiency, security precautions, creating scenario storyboards, and taking advantage of future technologies. 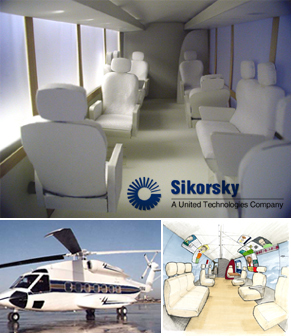 Several developed proposals were created which successfully broadened Sikorsky's view of possibilities and directions for their ongoing research and development. Sikorsky succeeded in receiving funds for further phases of this unique project. InfoLink is a system of stations throughout Paris that represents individual districts by creating a visually dynamic information space. Towers give people a glimpse of the district's activities and singular personality with a cascade of information and a retail window. The towers are separated into four categories: data, food, shopping, and culture. Digital displays are updated daily and physical objects refresh weekly. Information and product placement is based on a formalized selection process by the RATP, through user rankings and kiosk interactions, and through an advertising revenue model. The front side of the towers simply displays information, but an interactive wall and table on the back side of the towers allows people to get and give details about specific topics displayed on the panels. 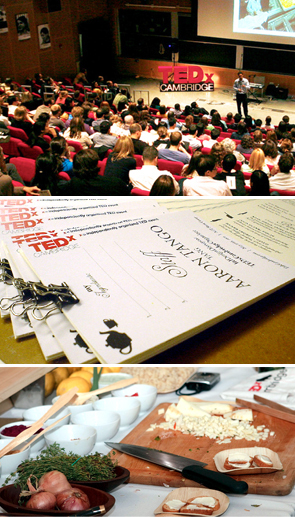 People can find the location of an event, a restaurant, or where a product can be purchased. This functionality gives people who are not waiting for the bus an opportunity to use InfoLink and makes the RATP more than a transportation service. Instead, it links people to neighborhoods. The RATP is already known throughout Paris, but with InfoLink, Paris can be known through the RATP. 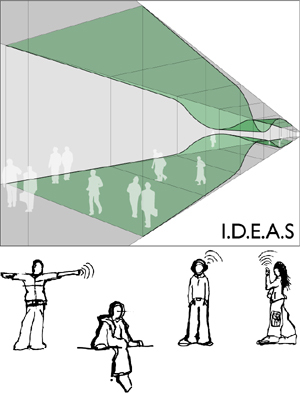 PopLink encourages social interactions among commuters, tourists, and other passersby with its engaging community space. Bus stops usually cater to two types of people. Commuters know where they need to go and are waiting for their bus to arrive, and tourists, or seekers, tend to look at maps to find out how to get to another location. PopLink capitalizes on these differences and turns people into route advisors. Co-organizing this non-profit event involved creating the program, inviting speakers, creating an event team, seeking an event space, art direction for speaker posters, name badges, menu guide, gifts, event space, stage, and webpage, sponsorship for musicians, food, demos, and catering, designing the event experience, and selecting 300+ invite only attendees for this one day. 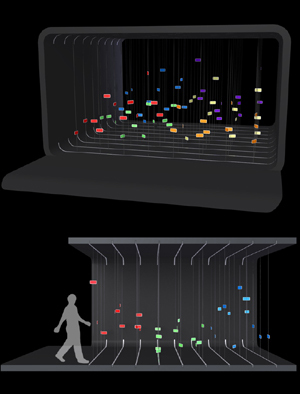 Soundscapes is a proposal for an interactive and engaging system within the Hall of Human Origins in the American Museum of Natural History. 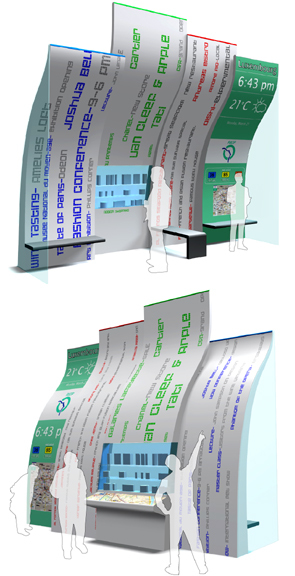 Soundscapes creates a dynamic exhibition space based on a user�s voice, hence creating a very unique experience for each individual. 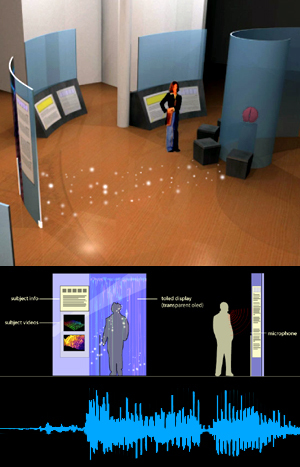 As a user enters the exhibit or kiosk their voice is captured and translated into a sequence of codes or in a sense a DNA for each different exhibition within the Human Brain portion; technology, art, music, language. This unique code integrates and creates a kiosks subject outcome for the user to observe, understand, and compare. Recordings and creations are kept as a fading history which creates a dialogue between different users throughout the exhibit for comparison. As a treat, the last kiosk takes ones voice and translates it into a unique truffle, a cup of coffee, or a keychain allowing users to share their specific experiences with others in a physical format. This door is designed around criteria based on an actual site in NYC. (Door Criteria Information) As an exploration in revealing the red Porsche as a trophy within the interior space, the use of lights, shadows, negative space and form were used to encompass the entrance to highlight the car. In configuring the function of the door, an idea was created that involved the concept of separate panels allowing separate entities to enter. 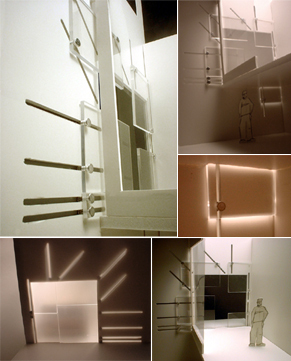 Dependant on the entity entering, individual panels reconfigure themselves in an elegant fashion, allowing a passageway. Such separate entities include, but are not limited to, the Porsche, a human being, a pet, air and a package. The glass panels are treated with PDLC, allowing a unique visual communication before the physical opening is created. Large hinges and spaces within the wall accompany the design of the door, communication a pre-direction of the panels and an elegant, fluid movement of the divisions inside. Industrial Design within an Encompassed Activated Space. Light has long been a metaphor for guidance, and has literally provided guidance via lighthouses and beacons for centuries. It is thus a natural choice for creating an ambient interface designed to guide people. 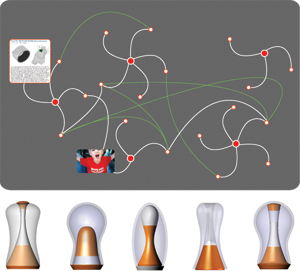 Sparks uses light to facilitate salient conversations by linking strangers with similar interests together in scenarios where the participants likely have many common interests, but little knowledge of those shared interest. The glowing links, in the ambient context, represent the available guidance. When a user chooses to follow a link, the link becomes a metaphor of their physical path, and the light as a beacon to their goal. 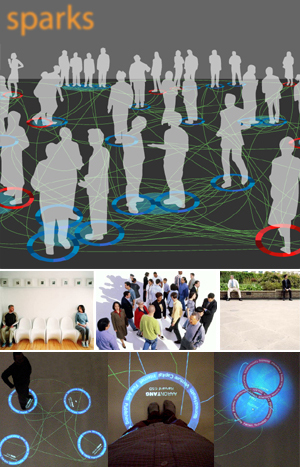 Each person is also surrounded by a "digital aura", projected outside their normal gaze, which leaves details available, but hidden "in plain sight". When those with similar interest approach, these shared interests are slowly moved outward into the periphery of vision, and after a time combine to form a common tableau for their conversation. The metaphor of physical paths allows intuitive usage without requiring explicit input, and thus enhances social interaction while preserving un-enhanced interaction modes without encumbrance. Blink is a real time information space installation that represents ongoing activities on a casino floor. The entrance contains several kinetic EL modules which represent tables within the casino pit. Theses modules change heights, colors, pulse rates, and rotation speeds based on table wager values, game types, game speeds, and chat activity. This project derived from an understanding of an �online casino� experience verses an actual �physical casino� experience. People don�t go to casinos just to gamble, they go there for a specific game, wager, atmosphere, and where the action is, the people. 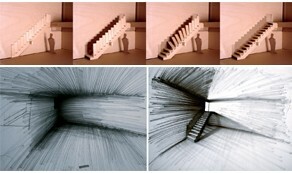 This entrance allows viewers to visually understand an active environment before they immerse themselves into it. 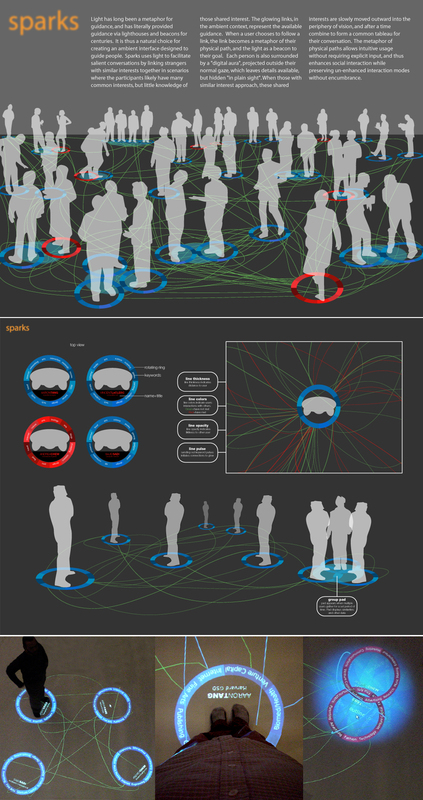 Mag_Nets transforms waiting space into an environment where users post, interact with, save and view connections between themselves and the members of their community. By manipulating digitally enriched pegs and viewing both the instant postings and connections between nodes, users see the commonalities between themselves and others while being brought up to date on the latest news and ideas within their community. 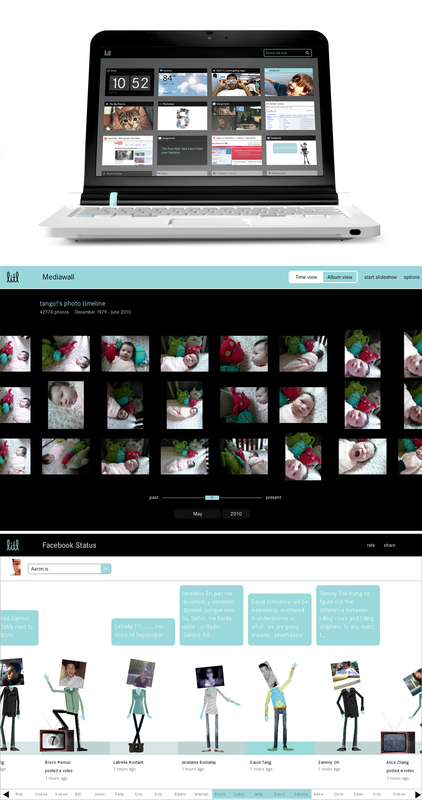 The litl OS is a simplified experience removing computive administrative debris such as files, folders, viruses, caps lock keys, and confusing function keys to focus on photos, videos, music, news, email, and empowering the web we use more than our computers. The webbook also flips over to an easel mode turning web pages into streaming shows to watch the web like TV. Sit back relax and let the litl webbook do the rest. Worry free about files because with the first cloud based litl OS, you'll never lose your data. It's about time the computer became human, focusing on the things people care about, not making them work for the computer. The litl OS is a collaborative project with pentagram, cooper, moto, and an amazing team of designers, developers, and idea shakers at litl. Visit litl.com to learn more and see the litl flickr gallery. 7 gallons of glue. As a final project and exploration in the Door studio, I discovered a new and unique use of a material. Through a previous project of passageways and doors, many functional doors were created. In this final exploration, the thought of how doors are assembled, combined or sandwiched was thought about. "Wood glue is used to combine materials and is rarely made to be visible, but it has never been used as a material by itself". Through the examination of this substance, I learned what and how this material could be altered, what it could and could not do and what its possibilities were. The challenge in this project was to make the material, the wood glue, structural within itself. In the end, the glue was transformed into three very distinct new materials: textured, strong and rubbery. 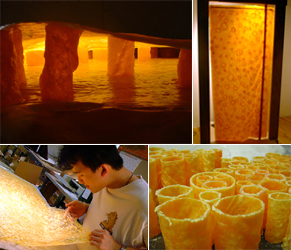 The opacity and translucency of the different stages of drying time also added an incredible visual when the material was backlit.